As loved ones and friends arrive for Thanksgiving this year, creating an ambiance of warmth and charm is something your guests expect. You're well accustomed to this festive process. The music playlist is ready, the scented candles are purchased, and the side dishes have been decided (and yes, your polarizing green bean casserole will be making an appearance). However, if you’re looking for a little added inspiration this year, we’ve created a Thanksgiving décor checklist of the 10 things we love to see most during everyone’s favorite holiday. Setting up a warm, welcoming entry decked in foliage, cornstalks, hay bales, pumpkins, chrysanthemums and lighting sets the tone for any Thanksgiving décor checklist. The warm, inviting hues of oranges, reds, golds and yellows juxtaposed against the façade of your home can herald the warmth and joy that your guests will love as soon as they set foot into your home. Thanksgiving Wreaths: Whether you’re doing it with autumnal leaves, mini-gourds, cranberries or pinecones, your thanksgiving wreath will steal the show. There are hundreds of ways you can go about it. Lighting Up Your Display: Lanterns, candles and votives can turn your front porch into a neighbor’s envy. Stuff large lanterns with mini-pumpkins and candles for a unique display, or carve pumpkins with Thanksgiving or fall-themed designs to line the steps leading up to your door. Decorative Fall Urns or Planters: Make sure your Thanksgiving décor checklist includes decorative urns such as this one - made with a display of artificial leaves, pumpkins, and other fall-themed decorations, sitting on a bed of Spanish moss and ringed by a burlap collar. These pieces can add a touch of rustic elegance to your display. 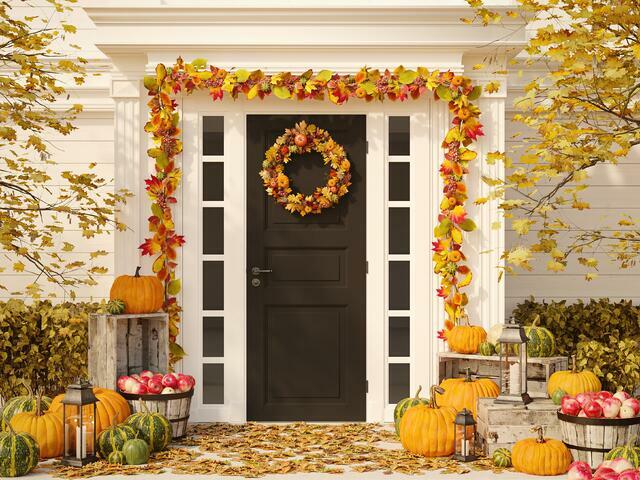 Harvest-themed Doorways: Spruce up your doorways with harvest-themed décor like cornstalks, and garlands made from chrysanthemums, fall foliage, mini-pumpkins, pinecones and berries. Create the right ambiance for the season by decking your living space in the warm, cozy colors of fall: from the mantel to the walls and the furniture, you can transform your living room into a cheery, welcoming space where your guests can settle in before dinner. Popping Colors: Brightly colored furniture in oranges and yellows, set against the neutral wall tones of beige, black and brown can draw one’s eyes the space, pulling them into the room. Or you can opt for brightly colored afghans and pillows as accents for neutral-toned furniture. Warmth-Suffused Spaces: If spots of colors aren’t your thing, you can always go for an overall theme of browns, oranges and golds that will enhance the warm glow emanating from the fireplace. Thanksgiving Mantels: Convert your mantel into a gorgeous Thanksgiving display with beautiful fall and harvest-themed decorations like pumpkins, dry foliage, hay, wreaths, pinecones and lots more. What better way to celebrate Thanksgiving than by doing so in the wide open spaces of your backyard. Deck your outdoor spaces like your patio and backyard in the spirit of the season, turning them into the perfect place to entertain guests before, during and after dinner. Alfresco Dining and Cozy Fireplaces: You can set up a rustic, yet cozy thanksgiving dinner next to the outdoor fireplace or firepit. Fall-themed Accents: Swap your summery fabrics for warm orange and brown hued upholstery for your outdoor furniture to blend seamlessly with the natural colors of fall. 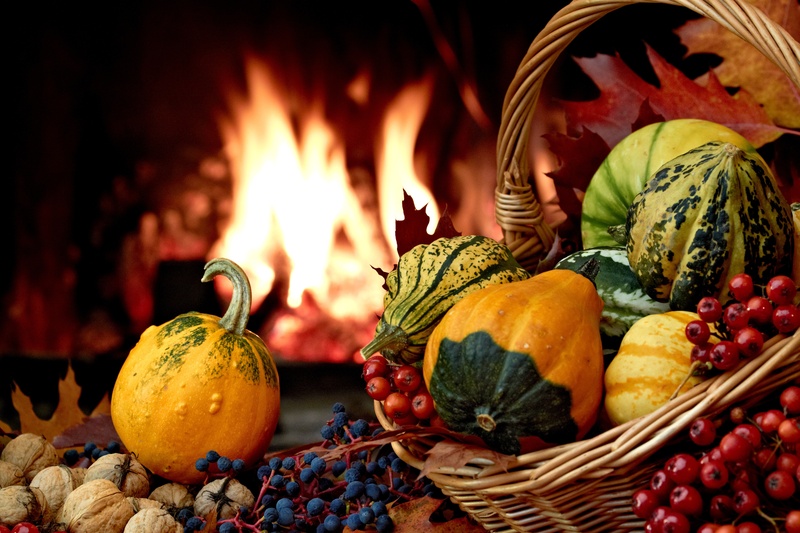 Fall Décor in Outdoor Spaces: Decorate your outdoor space and fireplace with pumpkins, gourds, flowers, and lanterns to create the perfect Thanksgiving aesthetic that your guests can immerse themselves in. The Outdoor Thanksgiving Table: The best part about dining outside is that the colors of fall can form a natural backdrop to your dinner. So, it’s only right that your dinner table matches it with décor that’s inspired by nature. Pencil in dark brown or grey furniture into your Thanksgiving décor checklist. 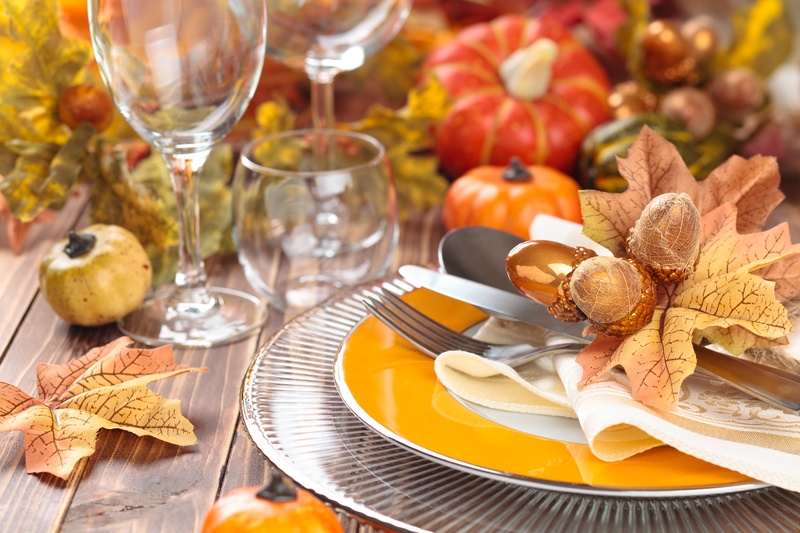 You can then offset the neutral tones with decorations such as pumpkins, candles in glass lanterns, wood and fall foliage, which can be used to create traditional Thanksgiving tables. Whites and Golds: Who says Thanksgiving should be all about the oranges and the reds? Go for a white and gold themed table, accented with white and gold-painted pumpkins, such as this chic table created by Living with Landyn. Dessert Station: Instead of serving up a plate of cookies to your guests this year, try including an entire dessert station in your thanksgiving décor checklist. Stock it with delectable treats like caramel apples, cupcakes and, of course, cookies. Flip the Script: In the gorgeous setting by Karin Lidbeck-Brent, she flipped the script on the traditional pumpkin orange scheme by making everything else but the pumpkins orange. The white pumpkins were then wrapped in twigs of berries. The entire scape was rounded off with a deep orange runner, unique place settings of glass balls filled with berries, and votive candles. Unique Place cards: Just like Karin did with her glass balls, accent your table with unique place-cards like this wishbone shaped holder that Coco Kelly used for her table or these mini-pumpkin place cards that Holly Mathis used on hers. What are your favorite traditional or non-traditional Thanksgiving décor ideas? Tell us in the comments.